Bonus: The Easy Print Version contains the pattern for the rabbit and the patterns for the chickens, rooster and cow. Embroidery Stitches to Know: Stem stitch, Backstitch, Satin stitch, French knot. Print out the pattern you want to use and cut out the muslin fabric to your desired size. Trace the lines of the pattern with a washable fabric pencil. Use the free redwork embroidery pattern alone or get all of these patterns as a set to embroider onto a quilt, table runner, set of pillows and more. 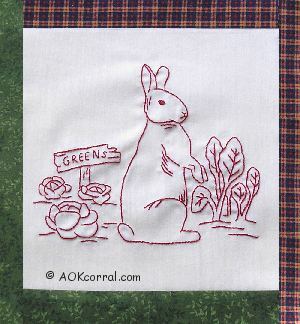 *This version includes the patterns for the rabbit, chickens, rooster, and cow.